Once baked, it is best to let the tart stand a while at room temperature so that the juices have a chance to cool and thicken. Then you can slice this confection easily and gild the lily by garnishing each serving with a dollop of crème fraîche and a drizzle of rosé syrup. The latter is made by simply reducing leftover rosé (plentiful around our house in the summer!) with sugar. Nothing says summer like a peach dessert! 1. Center a rack and preheat oven to 400 degrees F. Have ready a 9-inch tart pan with a removable bottom. 4. Dust dough lightly on both sides with flour and roll into a 12-inch round between two large pieces of waxed paper. Remove top sheet of paper and carefully transfer dough with paper side up to tart pan. Remove remaining paper and mold dough in pan. Trim overhanging dough to 3/4 inch. Then fold overhanging dough in and press to form double-thick sides. Pierce bottom of dough with a fork. Refrigerate tart shell until firm, 30 to 40 minutes. 5. Line inside of tart with a large sheet of parchment or foil and fill 2/3 full with dry beans or pie weights. Bake until dough starts to take on color, 15 to 20 minutes. Remove paper and beans and continue to bake until crust is light golden, about 15 minutes or slightly longer. 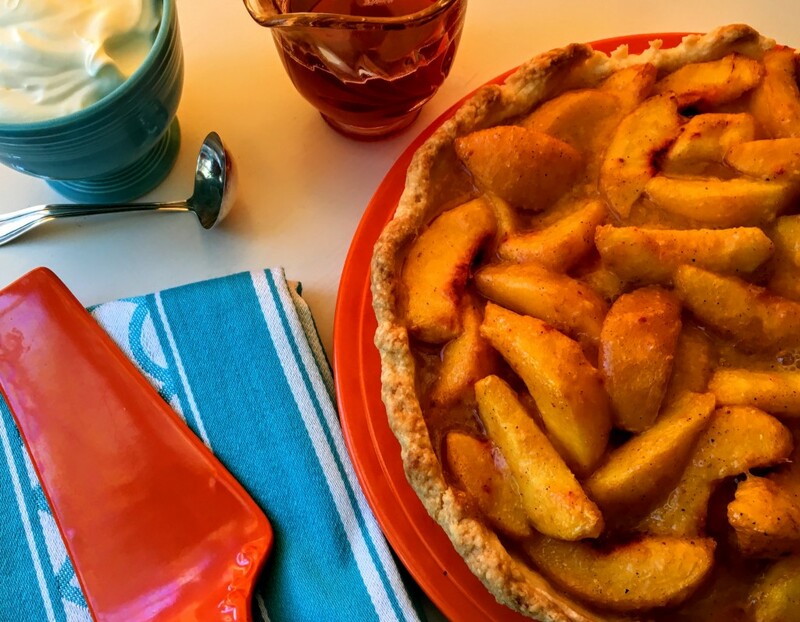 Remove tart and reduce oven temperature to 375 degrees F. 6..Prepare filling while crust is baking. Add 1 cup of the peaches, sugar, cardamom, cornstarch, and rosé to a food processor and pulse until smooth. Transfer to a medium saucepan over medium heat, and whisk until mixture just thickens, 1 to 2 minutes. Toss remaining peaches with pureed mixture in a large bowl and then spoon into tart shell. 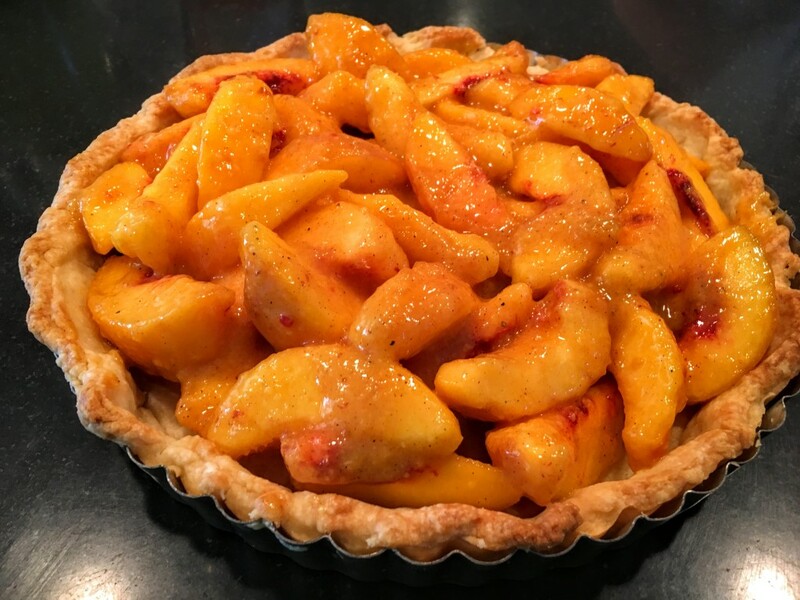 Bake until crust is a rich golden brown and peaches are tender, 25 to 30 minutes. Remove and cool at least 20 minutes so juices thicken. Note: For the best taste, use cardamom that comes from a new bottle or that you buy in bulk at stores like Whole Foods. It should be very aromatic. Note: To peel peaches, place them in a large bowl and cover with very hot water. Let stand for 40 to 50 seconds. Remove with a slotted spoon and cool. Then peel skin off with a sharp knife. This entry was posted in Food News and tagged creme fraiche, peaches, rosé wine, summer, tart by brosbottom. Bookmark the permalink. Well, sometimes there’s a little leftover rosé chez nous! Betty this tart looks wonderful, but since we have local peaches here in Michigan I just had to use your Good Old Fashioned Peach Pie recipe (vintage) from the Columbus Dispatch. It was wonderful. So glad you’re using that recipe! It’s still one of my favorites!